Incentivizing your referral program is one of the best things that you can do to make sure it performs well. Friendbuy supports a variety of different reward structures so you can tailor your referral program to match your business model. Rewards are specific to each campaign, so you can have different widgets with different reward configurations. If you’re using coupon or gift card codes as your rewards, Friendbuy can automate the reward fulfillment for you. If you're implementing a different type of reward, see the Advanced section below. Configure rewards on your widget. Using your eCommerce platform or a third-party application, create a list of coupon codes. Make sure these codes are integrated with your website. You also have the option of uploading PINs along with your coupon codes, these are used to reward customers with gift cards that require a pin, such as Tango Cards. Tip: If you use Shopify, you can use Shopify's Bulk Discount App to easily generate a large quantity of coupon codes. Export and save these codes to a .txt or .csv file with each code separated by a line break. Coupon banks with PINs must be in a .csv file with coupon codes in the first column and the PINs in the second column. If your coupon codes also use a reference ID, a third column with that data will need to be added as well. In Friendbuy, navigate to Coupons. 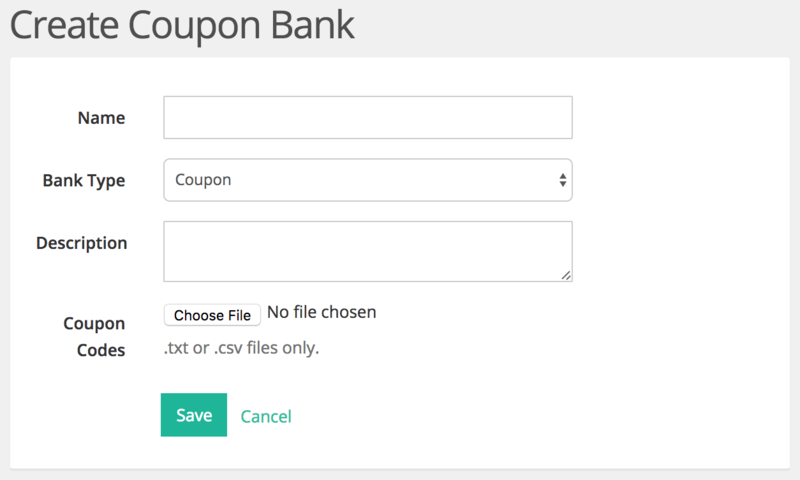 Click on Create New Coupon Bank. Give the bank a name and description. These are only used for your reference. Click on Choose File and upload the file that you previously exported. Note that processing the uploaded codes may take up to several minutes, so your new bank may not show up right away. Check back periodically to confirm that your bank was saved and that it has the correct amount of codes in it. In your Friendbuy account, click on "Referral & Sharing", and then on "Reward Emails". Then, click on "Create New Reward Email" in the upper right corner (note that if you have not configured your Email Sender, you will be prompted to do so before you can create a Reward Email). The Template Name is simply for your reference. Enter a subject for the email - this is the subject line your referrers will see when they get a reward email. Tip: If you use MailChimp, you can design the email there and move the HTML into Friendbuy. After saving the template, go ahead and preview the email to make sure that everything looks to be correct. If so, you can proceed to the next step. Click on "Referral & Sharing" on the left side of the Friendbuy Dashboard, and then on "Widgets". Click on the widget you want to configure. Click on Edit under the name of the variant you want to edit. This will take you to the Widget Builder. On the right side of the Widget Builder, you will see a section called Rewards. This section will list the reward amount for the campaign, as well as whether or not you have a reward email and coupon bank assigned to the widget. Click on Edit in the Rewards Configuration section. Fill out the form with the reward information. In order for reward emails to be sent out, the Reward Amount must be more than 0 and you must assign a Reward Email to the widget. If you are using a coupon bank with the reward email, you must also choose a coupon bank to use for the reward. All valid conversions from this point forward that are associated with a widget for which you have configured the reward will trigger a reward email. If you're interested in using a different type of reward, such as depositing credit into a customers account or sending out a free product, you can use our Rewards Webhook. The webhook will fire reward data to your system every time a reward is approved - you can then set up logic on your end to programmatically accept that data and process it however you'd like. If you're not implementing double-sided rewards (rewarding both the Advocate and the Friend), you can skip this section. Direct them to a landing page hosted on your website (by updating the Destination URL) that has a coupon code displayed on it for them. You'll want to display a multi-use coupon code that restricted to either one use per customer or new customers only to prevent any abuse of the coupon code. It's a good idea to include copy on this page with clear instructions for the Friend on how they can redeem their discount. You may also want to include a Call To Action that directs them back to your product catalog if applicable. Direct them to a landing page hosted on your website (by updating the Destination URL) that has an Email Capture widget installed on it. The Email Capture widget will prompt the Friend to provide you with their email address in exchange for a coupon code - you can either give them a generic one or configure it to distribute a unique code to each user. This execution is great for building a mailing list. Learn more about our Email Capture widgets here. If you'd like to take a more advanced approach to rewarding the Friend, you can use the UTM parameters in the Friendbuy Referral URL. These parameters will always be present and will identify which campaign a Friend came in from. You can use logic on your end to do a few different advanced executions, such as depositing store credit directly into the Friends shopping cart, or dynamically displaying a "welcome pop-up" with offer details for them when they land on your website.